This Desert Sunset Tote Bag is great for any reason. Grab it before you head to the store or the beach and fill it with all your essentials. 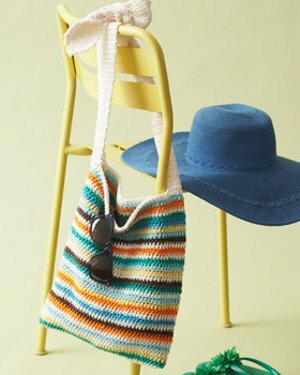 This crochet beach bag is made using a simple striped pattern, so it's great for beginners. Create one in your favorite colors to have a bag to match your mood. You could also make a solid colored tote bag by forgoing the color changes and using one color of yarn. Gauge: 15 sc and 16 rows = 4” [10 cm]. Approx 12” [30.5 cm] wide x 14” [35.5 cm] high, excluding handles. With MC, work 1 row. With A, work 1 row. With E, work 1 row. With B, work 1 row. With D, work 1 row. With F, work 1 row. With C, work 1 row. With MC, ch 84. Join in ring with sl st into first ch, taking care not to twist chain. 1st rnd: Ch 2 (does not count as hdc). 1 hdc in each ch around. Join A with sl st to first hdc. 84 hdc. 2nd rnd: With A, ch 2 (does not count as hdc). 1 hdc in each hdc around. Join E with sl st to first hdc. Keeping cont of Stripe Pat, rep 2nd rnd for pat until all 33 rows of Stripe Pat are complete. Fasten off. Place markers on 32nd hdc and 74th hdc of last rnd. With RS facing, join MC with sl st at first marker. 1st row: Ch 1. 1 sc in each of next 10 hdc. Turn. Leave rem sts unworked. Rep 2nd row until work from beg measures 18” [45.5 cm]. Next row: Ch 1. Sc2tog. 1 sc in each of next 4 sc. Sc2tog. Turn. Next row: Ch 1. Sc2tog. 1 sc in each of next 2 sc. Sc2tog. Turn. Next row: Ch 1. (Sc2tog) twice. Turn. Next row: Sc2tog. Fasten off. Rep for second handle, starting at second marker. Tie handles in knot at desired length. Join bottom edge: With RS tog, join MC with sl st at bottom edge. Working through both thicknesses, work 1 row of sl st across bottom edge to join. Fasten off. Really pretty! I love color. This seems like something that I would like to make for myself for this summer to take to the pool instead of lugging my purse with me. I like the casual look. An idea- to make a couple of pockets to attach to the inside so that my keys and sunglasses don't get lost in the bottom of the bag. You know, to make them easier to grab in a moment. That should be easy to add on. This is a gorgeous bag. Thanks for the beautiful pattern. We're so glad you liked it! Thanks for the comment, scrapingnana!